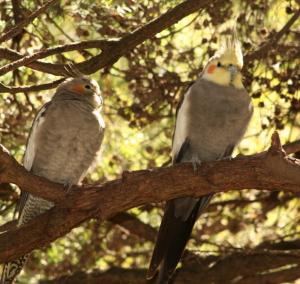 Cockatiels have a number of characteristics that show they are cockatoos rather than parrots. These include possession of a crest, a gall bladder and powder down feathers on the lower back. The tongue is rounded as it is in all cockatoos, they lack the green pigment that colours parrots, and there are many other anatomical, physiological and behavioural characteristics that align them with the cockatoos. Cockatiels feed on a wide variety of small seeds, preferring native grasses but also including crops such as sorghum and sunflower. Feed in flocks ranging from 20 to hundreds. Foraging tends to occur in two bouts – shortly after sunrise and again before sunset. They often associate with budgerigars. Breeding occurs from August to December in South Australia. The nest is placed in a tree hollow. The average clutch size is 4, and ranges from 1 to 7. Fledglings remain with the parent for about a month before joining a large nomadic flock. The Cockatiel, Nymphicus hollandicus (Kerr, 1792) is monotypic, having no subspecies. Cockatiels are our smallest cockatoo. They are of a brownish-grey colour, with a long stepped tail and a long, wispy crest. The sexes are similar, but the male is paler below, has a yellow forehead, crest, chin, throat and cheeks, the undertail is black, and has a bright orange spot on the yellow cheek. The female has a mainly grey head and crest, with a faint yellow wash. The orange cheek spot is duller, the undersurface faintly barred with dark grey and the undertail is barred yellow and dark grey. In both sexes the bill, the cere and feet are dark grey, the eye is dark brown, and the inner wing has large white patches on the upper surface. Juveniles are like adult females. Nestlings have abundant yellow down. 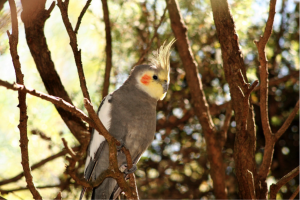 Cockatiels are moderately common throughout South Australia, except in the lower South-east and Kangaroo Island, where they appear only as vagrants. They favour arid and semi-arid country, if there are supplies of water. They are also to be found in a wide variety of other habitats including savanna, open woodland, riverine forest, orchards, cultivated areas and grain stubble. Cockatiels are strong fliers. Outside of the breeding season, they form large, nomadic flocks that follow the seeding of native grasses and cultivated crops, and therefore generally following rains. Like most granivores, they require water, and in times of drought flocks may even reach the coast.